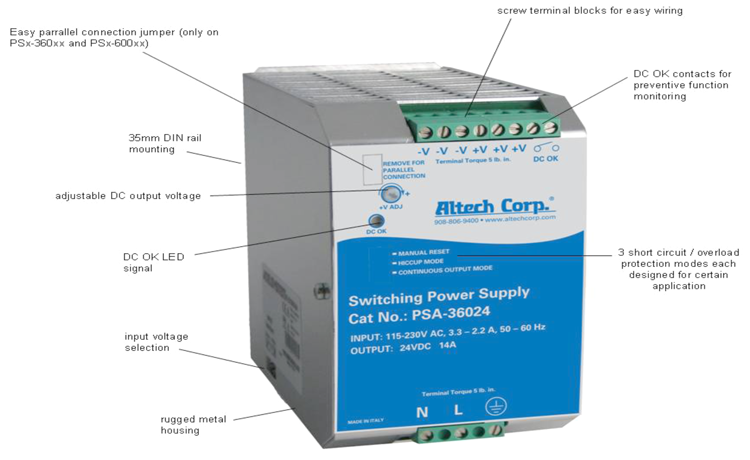 Altech's PSA / PSB power supplies stand for highly reliable products which can be operated in several protection modes to ensure a maximum level of safety. They also meet the latest technical standards and can be used even in extreme industrial environments. The PSA / PSB series is a AC-only input switching power supply that provides 24V DC output voltage and up to 20A output current. There are 1-phase 115-230V AC units as well as 2-phase 230-500V AC units, in both of which the voltage can be selected by switch. Furthermore, there is a 3-phase unit providing up to 600W. This series features three different short circuit / overload protection modes, each designed to assure safe operation in a certain load range. With its extremely small size, the power supplies throughoutly follow the trend of optimization and downsizing. In order to increase the power output, PSx-36042 and PSx-50024 units can easily be set up in parallel connection. For building redundant power systems to obtain a higher system availability, also see Altech's PS-RDN20 redundancy module. Additional standard functions include DC OK contacts as well as LED indication and output voltage adjusting. 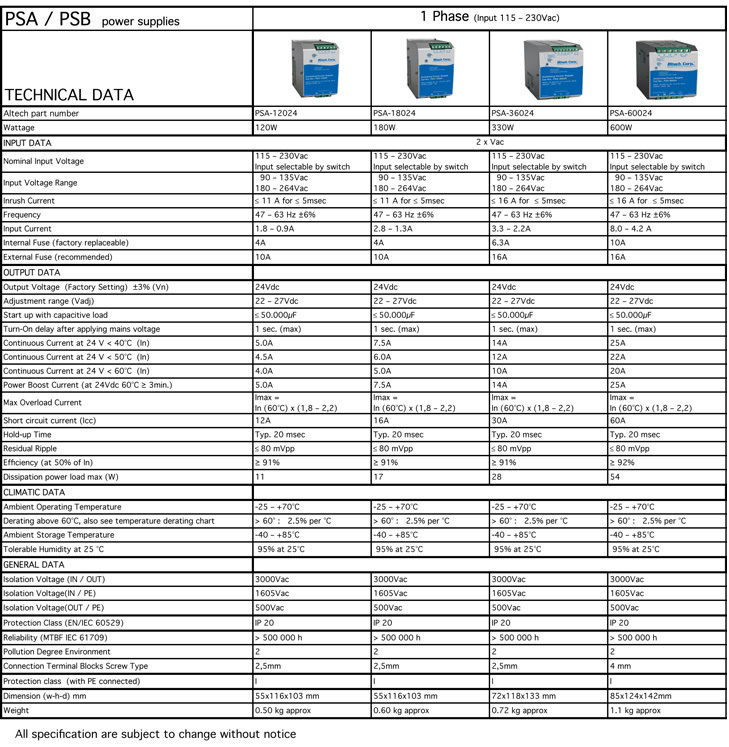 The PSA / PSB power supplies fulfill the requirements for EN60950-1 and complies to UL and CE certificates. PSA / PSB power supplies offer snap-on DIN rail mounting and easy wiring with srew terminal blocks.